A bit of self-promotion… just because I feel like doing it…! Oh, well… why not? Work has kept me a bit too busy these days, and once home, we’re greeted by the fully-energetic kids, who happen to be at their [insert a joyful screaming here!] last week of school vacation. So, because of that, just felt like doing a bit of ‘self-promotion’ and decided to share this link with you all. Vanessa Huet, from Voyage Perou, compiled 20 original photos of the Salar de Uyuni, in Bolivia, our previous home. One of the photos display an interesting couple, supposedly balancing their weight on a not-less-interesting fruit [guess who?]! 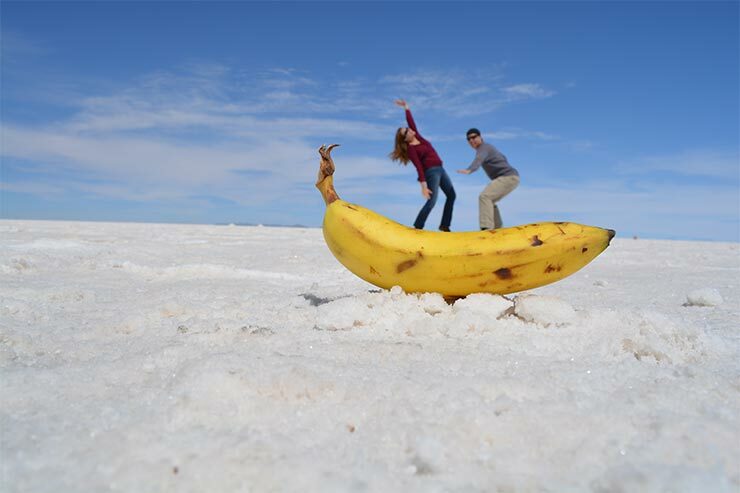 Things that one does when visiting the Salar! PS: The text is fully in French, but the images are worth a thousand words, so… enjoy! loved the photos… might have to try sometime…looks like fun…but, Yours are amazing! Congrats!!! Who is the one behind the lens???? very good picture indeed! congrats for the fame. by the way, who took it? Oi Pri! Viajamos com uma outra familia amiga, desde La Paz. Eles são marido americano, esposa argentina, 4 crianças. O marido tirou a foto. E coincidentemente, vamos nos encontrar na Argentina este Fevereiro… Beijos!